Netherlands players celebrate winning the final. The Netherlands lifted the Under-17 European Championship trophy at the New York Stadium in Rotherham after overcoming Italy 4-1 in a penalty shoot out in the final. The tie ended 2-2 in normal time, as both sides hit the back of the net twice in an entertaining second-half display. It was the Netherlands who created the first opportunity in the first period, Ryan Gravenberch cut inside from the left and smashed a right foot effort against the bar from 30 yards, his shot was unlucky not to find the net as Italy goalkeeper Alessandro Russo was beaten at full stretch. Both sides then missed glorious chances from only yards out as the clash surpassed the first quarter. The tie became end-to-end in stages, although, neither nation could capitalise on their dominant periods as decent opportunities went begging. The fixture was all level at the break after two minutes of added time. It was the Dutch side who had created the better openings and should have probably found themselves ahead as the teams went off down the tunnel. As the sides returned, it was the Dutch side who deservedly went ahead on their first attack of the half. Right-sided midfielder Jurrien Maduro found himself in the area with the ball at his feet from 10 yards, he swiped a shot against his Italian marker and the deflected shot looped over Russo in the Italian goal. The Oranges deservedly took the lead after their substantial first-half shots at goal. All of a sudden, as both sides returned to the centre spot for the restart, the tie turned on its head within a couple of minutes. Samuele Ricci equalised from an attack down the middle after his well struck shot from 25 yards hit the top left corner of the net. Italy had certainly come out a different side in the second-half and only moments after the restart, Alessio Riccardi made the clash 2-1 to the Blues and Whites. The Italians had pushed forward once more after gaining some momentum and Riccardi cut inside from the left and unleashed an outstanding shot into the top right hand corner of the goal. It was then in the 74th minute when Dutch substitute Brian Brobbey made the tie level after hitting home from a superb cross from the left. Game on. Samuele Ricci celebrates scoring equalising for Italy. With only six minutes of the fixture remaining, the trophy could’ve been going home with either side as chances continued to be created before the final whistle blew, therefore, penalties was going to decide the outcome of this European Championship final. The Italians failed to convert their first two spot kicks, leaving Dutch left-back Ramon Hendriks the opportunity top wrap up the title if he scored, which he consequently and coolly converted. The Italians fell to their knees in disappointment and the ecstatic Dutch players and management staff began to celebrate on the field, before lifting the trophy soon afterwards. 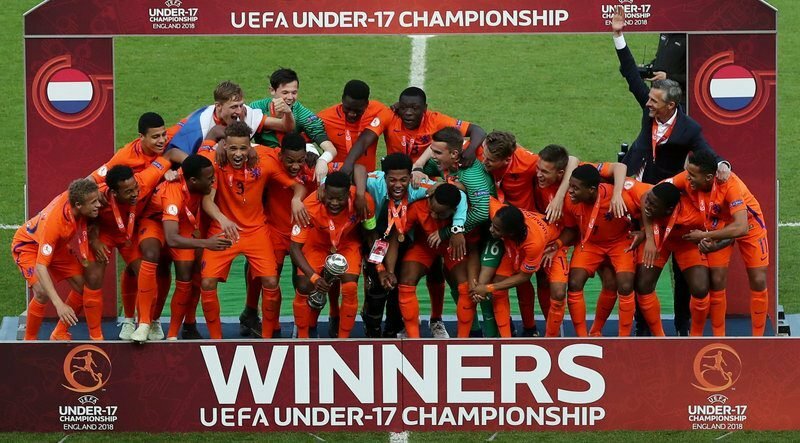 This exciting two-week tournament on English soil came to a close as the Netherlands won the Under-17 European Championships for the third time in their history. 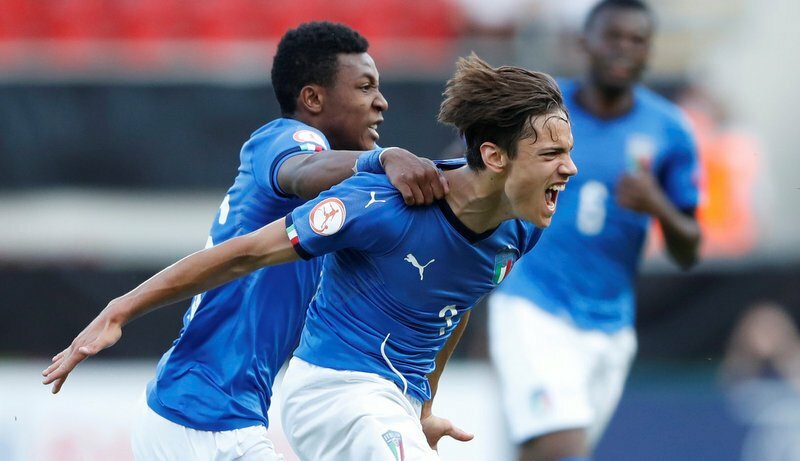 Italy Under-17s: (4-3-3): Russo (GK), Barazzetta, Brogni, Leone (Fagioli, 55), Armini, Gozzi Iweru, Ricci (Rovella, 79), Gyabuaa, Vergani, Riccardi (C). Netherlands Under-17s: (4-3-3): Koorevaar (GK), Van Gelderen, Hendriks, Burger, Redan (C), Q. Maduro, Ihattaren, Gravenberch (Brobbey, 69), Tavsan (Summerville, 64), Mamengi, J. Maduro.